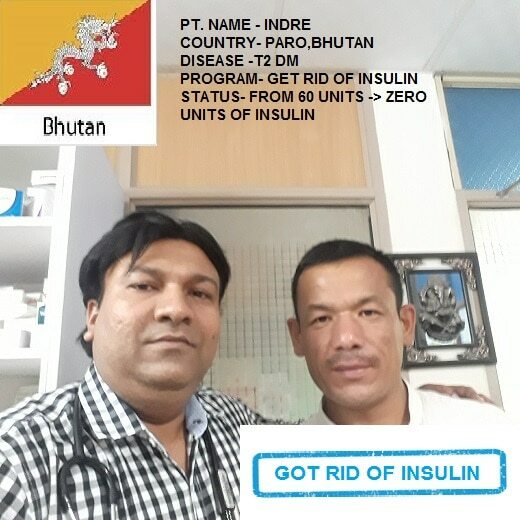 5 CONTINENTS ; 35 COUNTRIES ... CASE STUDY FROM BHUTAN PATIENTS NAME : INDRE CITY: PARO COUNTRY : BHUTAN AGE: 40 YEARS DISEASE : TYPE 2 DIABETES MELLITUS, HYPERTENSION, HYPERURICEMIA PACKAGE: INTERNATIONAL GET RID OF INSULIN PLAN( I- GRIP) Pt . came with uncontrolled blood sugar levels, his fasting was 279mg% and pp - 416mg% & HbA1c- 13.6 , he was on high doses of insulin (20 units ~~ 3 times daily. His blood pressure was also raised 160/100 mm Hg, uric acid was high too (9.1). KFT, LIPIDS & LFT were borderline. Pt. was put on GET RID OF INSULIN (GRIP) plan & he made rapid progress with our medicines, diet and lifestyle regimen. After 3 months of treatment, his fbs- 106 , ppbs- 144 , HbA1c - 8.4 plus his insulin requirement has come to zero, blood pressure and uric acid are normal. TAKE HOME MESSAGE- anyone can get rid of insulin at any stage of type 2 diabetes, if they have functional beta cells in their pancreas. It can be easily determined by tests, according to DR . ANIRBAN BISWAS - Diabetologist (who has helped over 1200 patients all over the globe to get rid of insulin), as many as 50-60 % of type 2 diabetes patients do not require insulin as most of them have functional beta cells till late stage of disease.